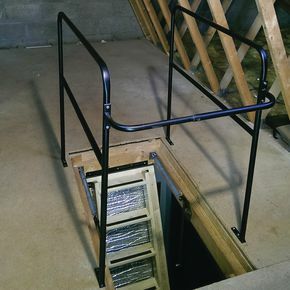 Provides a safety rail, 1 mt high, to three sides of the loft opening. Telescopically adjustable width to standard loft openings. Safety precautions are a good idea, whether you're at home or work, steps should be taken to ensure your safety as much as possible. Our loft opening ballustrade is an ideal way to create more security and prevent accidents while you are working in a loft area. It forms a barrier around the sides and the rear of the loft opening preventing someone from accidently falling through if they are not paying attention to where they are going. 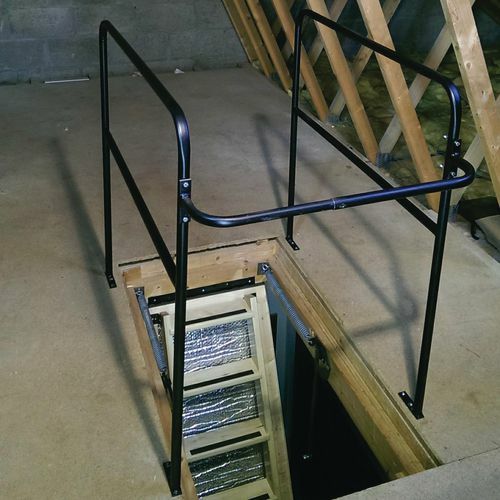 Providing a safety rail of 1m high to three sides of the loft opening is a great way to stay safe while storing or removing items from your loft space. They are telescopically adjustable in width allowing them to suit most standard size loft openings. Our loft opening ballustrade is a great addition to put around a loft hatch to prevent accidents, such as helping to prevent a serious incident if someone trips over near the loft entrance. They also come with FREE UK Delivery.